Once Upon a Climb is the name of the third chapter for The Odd Gentlemen's King's Quest, published by the new Sierra. Set roughly at the same time as King's Quest II (which I played recently), this chapter is a re-telling of how King Graham finds his future wife Valanice, and when I say “re-telling", it's almost a totally different version of events: Yes, there's a witch called Hagatha. Yes, there's a tower where Valanice is imprisoned in. Yes, Graham has to go to the kingdom of Kolyma to rescue her, but besides the things I've already mentioned, everything is different. 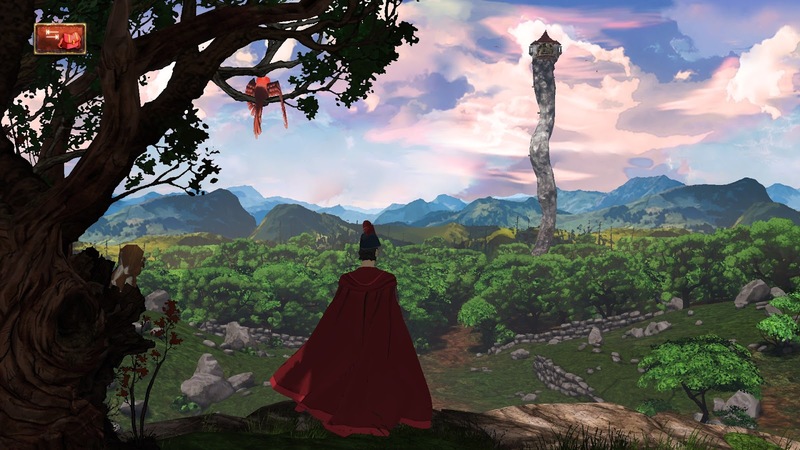 Once again, King's Quest straddles between the adventure genre and something else. In the second chapter, the game felt a lot like a survival management simulator along the lines of The Organ Trail or The Banner Saga where you have to manage limited resources to ensure your party's survival. In this chapter, your goal is to woo your future wife since there isn't just one Valanice, but two (okay, mild spoiler but it's not that far into the game when you discover this)! I personally found this better than the original King's Quest II since, despite it probably staying very true to how fairy tales work, princesses immediately falling in love with their rescuer and marrying them is usually a recipe for disaster. Which is apropos considering that's what this chapter is all about (or maybe it should be renamed "Girls in the Tower"?). You've still got the same veteran voice actors from previous chapters and they're doing new characters - which just goes to show how versatile they are! You also have Cherami Leigh playing the role of the lovable (although some would say ditzy) Neese. Just like previous chapters, there are quite a few references to the original King's Quest games. My favourite one occurs right at the beginning of the chapter where you have a passage of time puzzle and are responsible in determining whether an iconic King's Quest V character lives or dies. Just when you thought it couldn't get any worse, out comes Once Upon a Climb where the puns are laid on thick – especially when you attempt to out-pun (is that even a word?) one of your potential wives. Despite the game following the life of King Graham, we've also learned a bit more about his family in the first two chapters, especially his grandchildren. This chapter is well and truly dedicated to Valanice, King Graham's wife and the choices you make during this chapter will ultimately affect who Valanice actually is, including all her likes, dislikes and character traits. This seems to be all the rage nowadays, with books like “Wicked" (which became a popular Broadway musical) giving reinterpretations on classic tales (“The Wizard of Oz" in this case) and making out the villains (The Wicked Witch of the West) into tragic characters. A similar thing happens here with Once Upon a Climb and I like it. Just like Chapter 2, Once Upon a Climb feels a bit rushed, especially towards the end of the game. While the character development with Neese and Val gets off to a good start, towards the end of the game you'll notice there'll be a string of random quests with very little plot or character development in between, giving the impression that some content may have been cut out or not completed in time. Using a mix of mouse and keyboard can be confusing at times. Usually, I just thought of them as alternate ways of doing the same thing but there is one part in the game where you cannot rely on the mouse alone and if you do, you'll miss out on the solution to a rather obvious puzzle. In fact, I knew exactly what needed to be done but since I never figured out how to select a particular object (until reading a walkthrough) I spent almost an hour trying different combinations when the solution was staring at me straight in the face the whole time. Not as long as the first chapter. This actually doesn't bother me that much but some people might not like the fact that the third chapter, similar to the second, is only about three hours long (I took four hours because I got stuck on a puzzle). Once Upon a Climb is a contemporary revision of the events in King's Quest II and I must say, I prefer this version better: Valanice isn't two-dimensional like she was in King's Quest II, Hagatha is portrayed in a sympathetic light and how can you beat the addition of GIRL IN THE TooOOOWER as part of the soundtrack? The chapter does feel a bit rushed though and like Rubble Without a Cause, is shorter than the first chapter. Is the game worth $9.99 USD? : Yes. While this chapter is still not as long as the first chapter it feels more light-hearted than the darkness and moral ambiguity of the second chapter – so it felt more like a King's Quest title.